The Audit Log is the keystone of your system of inventory control. Every transaction that adds or subtracts from your inventory is recorded in the Inventory>Audit Catalog. Store: shows the store at which the Transaction took place. If you only have one store you will only that store name appear in this column. Audit Date: records the exact date and time the Transaction was completed (i.e. the user pressed <F12>). Document: indicates the type of Document that was used to change the inventory level. See the How Transactions Affect Inventory topic to learn how each document can change inventory. Number: displays the Document number. Use this document number to find the document in the appropriate Documents Catalog. Init.Qty: shows the initial or starting quantity, e.g. the amount of pieces of merchandise you had in stock before the new entry/transaction took place. Qty.Chng: shows the amount of pieces of merchandise that are either added (positive number) or subtracted (negative number) from your stock level. End.Qty: shows the end quantity or the new stock level once the Qty.Chng has been added to the Init.Qyt. The last chronological entry in the Audit Log for a given Store is in fact equal to the stock you currently have on hand for that store. In the example above, the last chronological entry for the Robson store occurred on April 3, 2003. Since there have been no subsequent entries in the Audit Log (i.e. transactions that have changed the inventory), you can assume that the amount in the End.Qty. is equal to the pieces of merchandise in that store. Furthermore, this is the same amount that gets displayed in the appropriate Store/Color/Size cell of the XpertMatrix™. In other words, looking at the Audit Log for this Item you can see that you currently have 2 pieces in stock in the Robson store. Furthermore, you can see why you have two pieces in stock: on February 27th you received a shipment of 3 pieces; on March 3rd you sold one of those pieces which took your stock level down to 2; on March 13th you sold those 2 remaining pieces but on the following day one of those was returned, leaving you with one piece on hand...and so on and so on all the way up to the most recent entry. When you first start using XpertMart™ you will gain confidence in the system as you see an entry made into the Audit Log every time you make a Transaction until you learn to instinctively trust what the Audit Log is showing you. With the Audit Log you can see not only what you currently have in stock, you can also see what you had in stock on a particular day. You can assume, for example, that on March 17th you had one piece in stock of this particular item. (Until you actually do a Physical Inventory the best you can say is that this is an informeded assumption). More importantly, the Audit Log always tells you why you have the stock that you have since it gives you the complete history behind that piece of information. The Audit Log, then, is where you go for answers when you have questions about your inventory. 1) Detect a discrepancy in the stock data of a particular item. Usually this happens during a Physical Inventory after you have find uploaded and applied the Counts but before you have Applied the Physical and generated the Ajdustments to inventory and you see that there is a difference between what the system says you have in stock and what you counted. However, your suspicion may be raised other ways: when you see a negative quantity number in the XpertMatrix™ of a Style or when you can't find an item in your warehouse that the system says you have in stock. Once you've identified the problem, get the Item Number for the item in question. 2) Open the Items Catalog and do a Query by Example in the Item Number field to recall the item you are looking for. Open the item's Audit Log. 3) Examine the Audit Log and look for any Transaction that looks suspicious. You may find a negative number when you expected a positive number (such as on an Invoice). Or you may find unusually large or small numbers indicative of a typing error (such as an invoice where 30 items were sold). Other things to look out for include an excessive amount of returns in a short period of time, cancelled transactions and redundant transactions (such as multiple inter-store transfers of the same merchandise). Once you've identified a suspicious transaction, get the Document Number for the transaction in question. 4) Open the Documents Catalog and find the transaction in question. Look for clues that confirm your suspicion. You may end up concluding that there was a typing or data-entry error, or that the wrong document type was used that added added to inventory when the user meant to subtract and vice-versa. The beauty of the Documents Catalog is that it records when the transaction took place and who was logged in at the time so you can hold them accountable. In other cases, however, you will not find any clear answers. Everything in the Audit Log matches but you are still short 5 pieces according to the Physical Invnetory reports. At least in these cases you have done enough of your homework to rule out an administrative error and you're looking at either shoplifting or fraud as possibilities. 5) Correct the Problem. If the problem turned out to be a data-entry or administrative error, then you can make a counter-transaction to correct the problem. Follow-up with the person who is accountable for the transaction in question and make sure they understand the error. If the incidents of error continue, you might consider taking disciplinary action or, more ominuously, investigating whether these "errors" are really errors and not a way to disguise fraud that may be going on. If you cannot conclude that the problem was a simple error you will have to make an Adjustment to keep the inventory information in the system accurate. However, you will want to be absolutely certain you have no other explanation for the discrepancy before making the Adjustment. 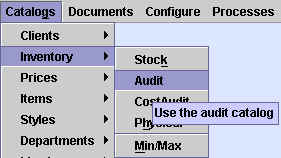 (Sometimes you will have to look beyond the Audit Log of a single item. If you find that Item #67 is short 3 pieces and item #76 has exactly 3 pieces too many, you may reasonably conclude that somewhere along the way someone got them confused). Remember, an Adjustment in the end is an admission of failure of sorts and an indication of potentially serious problems with your retail operation. When you make a negative Adjustment to inventory you are giving up money, so be absolutely sure before you proceed. And when you do, start thinking about other measure you might need to take to prevent the problem from recurring. You might need tighter controls over your merchandise, stricter management policies or better use of the tools at your disposal to track your inventory.